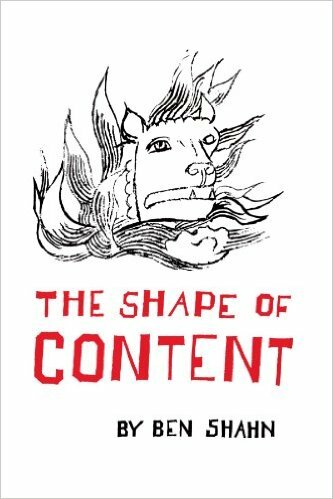 “The Shape of Content”: (Charles Eliot Norton Lectures, 1956-57) by artist Ben Shahn was an important book in my life — if only because I took away just one little piece of wisdom, the answer to the question, What is form? The form of something is, to put it simply, the shape of its content. And the example I recall is … a tree … an individual tree … different from any other tree, taking the form of its own special, inner content … and what I took away was to not worry about the outer form of what I am writing, but, instead, to let the subject matter — the content — take its unique shape and become whatever it wants and demands to become. Thanks for this. It is so important to be reminded how organic the creative process is. Its golden thread is integrity between impulse and execution. Shahn’s wife, Bernarda Bryson, was also a very great artist. Her color watercolors of the book ‘Gilgamesh’ are documents of myth and symbolism. She lived to over a hundred years. “While I concede that almost every situation has its potential artist, that someone will find matter for imagery almost everywhere, I am generally mistrustful of contrived situations, that is situations peculiarly set up to favor the blossoming of art. I feel that they may vitiate the sense of independence which is present to some degree in all art…. One wonders how Cézanne would have progressed if he had been cordially embraced by the Academy. I am plagued by an exasperating notion: What if Goya, for instance, had been granted a Guggenheim, and then, completing that, had stepped into a respectable and cozy teaching job in some small – but advanced! – New England college, and had thus been spared the agonies of the Spanish Insurrection? The unavoidable conclusion is that we would never have had ‘Los Caprichos’ or ‘Los Desastres de la Guerra’…. “I believe that if the university’s fostering of art is only kindly, is only altruistic, it may prove to be also meaningless. If, on the other hand, the creative arts, the branches of art scholarship, the various departments or art are to be recognized as an essential part of education, a part without which the individual will be deemed less than educated, then I suppose that art and the arts will feel that degree of independence essential to them; that they will accept it as their role to create freely – to comment, to outrage, perhaps, to be fully visionary and exploratory as is their nature. “Art should be well-subsidized, yes. But the purchase of a completed painting or a sculpture, the commissioning of a mural – or perhaps the publication of a poem or a novel or the production of a play – all these forms of recognition are the rewards of mature work. They are not to be confused with the setting up of something not unlike a nursery school in which the artist may be spared any conflict, any need to strive quite intently toward command of his medium and his images; in which he may be spared even the need to make desperate choices among his own values and his wants, the need to reject many seeming benefits or wishes. For it is through such conflicts that his values becomes sharpened; perhaps it is only through conflicts that he comes to know himself at all. Great stuff and much appreciated.